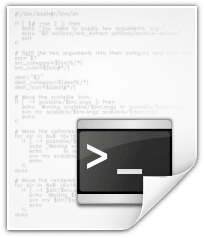 Description: Recursively replace spaces with underscores in file and directory names. echo -en "\n BEWARE! Starting from current directory (`pwd`),"
echo -en " files and directories with spaces in name  will be renamed automatically.\n"
echo -en "\n Press \"ENTER\" to continue or \"N\" to exit:"
echo -en "\n Canceled by User. Exiting...\n"
number=0                    # Number of renamed. number_not=0		    # Number of not renamed. array=( `find ./ -type d` ) # Find catalogs recursively. # Go in to catalog. # Search of all files in the current directory. # Check for spaces in names of files and directories. echo "$name" | grep -q " "
# Replacing spaces with underscores. echo " Not renaming: $name"
# Plus one to number. echo -en "\n All operations is complited." then echo -en "\n $number_not not renamed." then echo -en "\n Nothing been renamed.\n"
then echo -en "\n $number renamed.\n"
else echo -en "\n Renamed files and catalogs: $number\n"